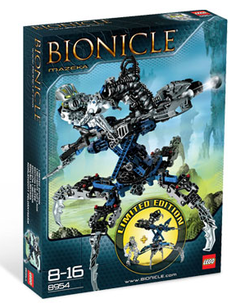 8954 Mazeka is a BIONICLE set released in July 2008. It was exclusive to Wal-Mart and LEGO Retail Stores in the US. It contains the Ko-Matoran Mazeka and his Swamp Strider with a modified Midak sphere launcher. This is a description taken from LEGO.com. Please do not modify it. (see an archive of the product's page) He strikes for justice! Mazeka travels to Karda Nui on his Helryx Swamp Strider to strike for the Order of Mata Nui! This brave Matoran dares any danger to stop the evil Brotherhood of Makuta. His Midak skyblaster turret rotates 360 degrees and comes with 9 light spheres. Adjust the legs of the swamp strider, load your skyblaster and prepare for battle! He strikes for justice! Mazeka travels to Karda Nui on his Helryx Swamp Strider to strike for the Order of Mata Nui! This brave Matoran dares any danger to stop the evil Brotherhood of Makuta. His Midak skyblaster turret rotates 360 degrees and comes with 9 light spheres. Adjust the legs of the swamp strider, load your skyblaster and prepare for battle!